portable generators Archives - Black Creek Services Inc.
Springtime is Outdoor Equipment Maintenance Time! 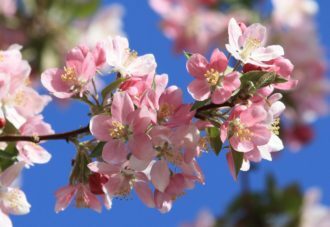 Springtime is such a great time of year! Buds are blossoming, the grass is starting to grow again, leaves are popping out on shrubs and trees! Time for Outdoor Equipment Maintenance! 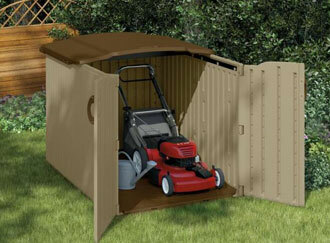 Is your Lawn Mower, Lawn Tractor, Riding Mower, Portable Generator, or Pressure Washer ready for Spring? Black Creek Services can perform routine maintenance on your small engine-powered equipment, or repairs, as needed, to get your equipment ready to go, when you need it! Cost: Payment required – Estimated maintenance service fee is based on type of equipment to be maintained. – – Repairs and pickup and delivery service fees are in addition to maintenance fees. – – Call 904.449.3986 for an estimate and to make an appointment for your equipment. We offer equipment pick up and delivery service for people in Middleburg, Fleming Island, Orange Park, and the Jacksonville area, from our Middleburg, Florida shop. Call Black Creek Services today 904.449.3986 to make your appointment to get your Outdoor Power Equipment Ready to Go when You are! What size Portable Generator do You Need? Portable generators can provide emergency power for your home or business when your electrical power service is disrupted. The size/power capacity of portable generators are measured in its rated wattage output. Before buying a generator, you need to decide how many appliances you need to provide power for. Then size your portable generator to provide power for the total of the STARTING watts you need. Chart data provided by our local, reliable electrical service provider, Clay Electric Cooperative. 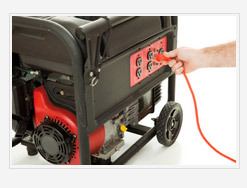 Read more tips for portable generators in our article, Safe Operation of Portable Generators. Having problems with your portable generator? 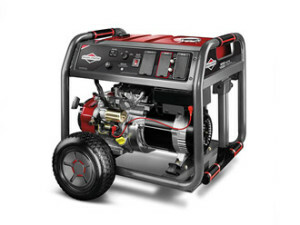 Or do you have questions about buying or maintaining your portable generator? Give us a call at Black Creek Services 904.449.3986, or Contact Black Creek Services. We like helping people keep their portable generators running! 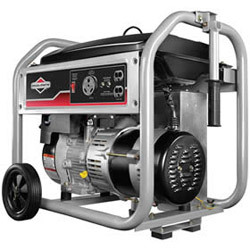 If you are thinking about buying a portable generator for emergency electrical power to your home or office during a power outage, such as during a hurricane, here are a few quick tips for safe operation of portable generators to help you get started. 1. Portable generators are designed for providing temporary power to one or several appliances, based on the output of the generator and the power requirements of the appliances. 2. The first step in buying a generator is deciding how much wattage you need during an emergency power outage. The size of your generator in wattage is determined by which appliances you want to power and how much total startup energy they need. 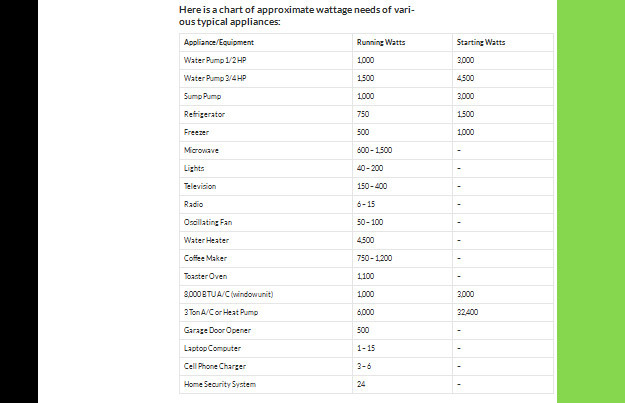 See our Chart for approximate wattage needs of various appliances. 3. Check the rating of the extension cord that you use to connect each appliance to your portable generator to be sure the cord is designed to carry the full amount of electrical current to the appliance. 4. Portable power generators are not designed to be run continuously, nor run inside your home or garage. They should be run (outside) for short periods of several hours, and then shut down for several hours before being run again. 5. We recommend adding a fuel stabilizer to your fuel tank , and running your portable generator for at least 10 minutes each month, to keep it ready to go when you need it. Is your portable generator not running or giving you other problems? Black Creek Services can provide mobile, on-site repair service, and an annual servicing to your portable generator to help you keep it ready to go. Call 904.449.3986 for an appointment. or Contact Black Creek Services. Ready for Florida Hurricane Season in Jacksonville? 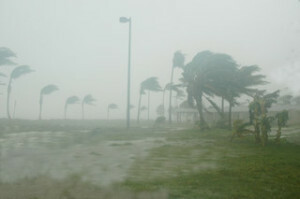 Being prepared during this hurricane season in Jacksonville Florida is very important. 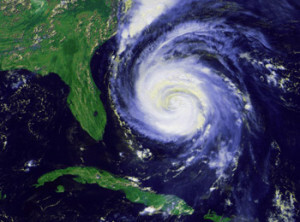 Hurricane Season for the United States Atlantic Coast runs from June through November. Waiting until you see a storm nearby in the Atlantic, or see a Hurricane Watch or a Hurricane Warning being flashed across your television or smart phone screen could be too late to protect yourself, your family and loved ones and your property. A little preparation goes a long way to being prepared for a hurricane coming to the Jacksonville Florida area. Please take some time to go over Hurricane Preparedness lists like the one at the NOAA National Hurricane Center. A few minutes spent gathering resources and preparing a plan for you and your family can mean the difference between survival and sorrow. Do you have a portable generator for providing emergency electrical power to your home or business? Is your portable generator maintained annually, and run periodically, to make sure it is ready when you need it? Black Creek Services, Inc. provides in-shop and on-site, mobile portable generator maintenance and repair. No portable generator is too big or too small. If you have a portable generator, and it needs annual maintenance, or you are having trouble getting it to start or stay running, or it will not provide the power that it used to, call Black Creek Services, Inc. 904-449-3986 for an appointment to get your portable generator ready to go when you are! Let us help you have confidence that your portable generator is one thing you don’t have to worry about during this Florida Hurricane Season. 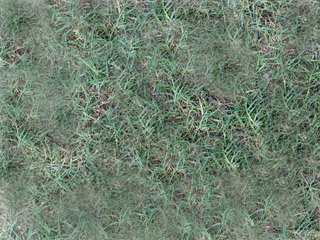 When it’s wintertime, a lot of people put their outdoor power equipment away until the Bermuda grass starts turning green again in the spring. But before you put your outdoor power equipment away, it’s important to do some winter care for your outdoor power equipment. Doing a little preventive maintenance winter care on your equipment will help you avoid problems when you try to start it up in the spring. One of the easiest preventive maintenance steps to protect your power equipment this winter is to add Briggs & Stratton 5-in-1 Advanced Formula Fuel Stabilizer & Treatment to your gas tank. We recommend that the first step in any small engine maintenance is to review the instructions in your power equipment Owners Manual. Next run your lawn mower, lawn tractor, or pressure washer (outside). Running the engine will get the fuel additives and preservatives that protect your small engine from the effects of ethanol damage through your engine fuel system. Finally, top off your fuel tank to prevent accumulation of moisture that could lead to corrosion. Please read our Portable Generator article for preventive maintenance recommendations. 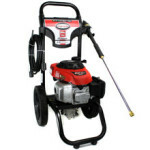 Don’t have time for winter care to repair or maintain your outdoor power equipment? Just give Black Creek Services a call at 904.449.3986. We can help you keep your small engine-powered equipment maintained for a fair and reasonable price. Pickup and delivery service is available, too! When springtime rolls around, we can also help you make sure your power equipment is ready for a busy season with a Springtime Small Engine Maintenance Service. 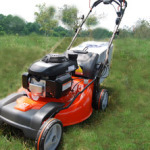 Black Creek Services, Inc. offers mobile lawn mower repair and mobile lawn tractor repair in the Jacksonville Florida area. We work on outdoor power equipment for people living in Jacksonville, Orange Park, Fleming Island, Green Cove Springs, and Middleburg, Florida. If you have questions, please call us 904.449.3986 or Contact us. We like to help people get their small engine-powered equipment running right again! But if you are done with your power equipment until the Bermuda grass starts turning green again in the spring, the main thing you need to remember is to add Briggs & Stratton 5-in-1 Advanced Formula Fuel Stabilizer & Treatment to your gas tank. the first step in any small engine maintenance is to review the instructions in your power equipment Owners Manual. yourself, give Black Creek Services a call at 904.449.3986. We can help you keep your small engine-powered equipment maintained for a fair and reasonable price. 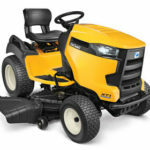 Black Creek Services, Inc. offers mobile lawn mower repair and mobile lawn tractor repair in the Jacksonville Florida area. We’re talking Jacksonville, Orange Park, Fleming Island, Green Cove Springs, and Middleburg, Florida. Many people living in Florida have purchased a Portable Generator to provide some electrical power if their primary electrical service is lost. Thankfully, for most of us our primary electrical service is very reliable. But during Florida Hurricane Season (June through November each year) or even during a more common thunderstorm, or as the result of an accident, there can be a power outage that can last from minutes to hours, even days. And to provide a reliable backup source of electrical power, we have a portable generator. Because our primary electrical power service is so reliable, often our portable generators can sit for months without being needed. If they are not run periodically, they may not perform when we need them. “It’s a good idea to have a professional service your portable generator once a year.” – Allstate Insurance, on Portable Generator maintenance. 1. Read and follow the instructions in the manufacturer’s Owner’s manual for your portable generator. If you do not understand the instructions clearly, give them a call; most manufacturer’s have a telephone number in the Owner’s manual, and many are toll free. 2. Put a fresh half gallon of fuel in the generator fuel tank, once each month, and run the generator for at least an hour. Drain any left over gasoline from the fuel tank. Gas goes stale when left sitting in a fuel tank for a month, and is harder to start. As an alternative, some people add a fuel stabilizer (such as Briggs and Stratton fuel stabilizer treatment) to the fuel in their tank, which helps the fuel stay fresh longer. 3. Check your generator starting method. If your portable generator is a manual, pull-start, check the pull rope for wear as you pull it to start the generator each month. If the rope is worn, it should be replaced so it doesn’t break when you really need that generator. If your portable generator is a battery started model, check the charge on that battery. Some portable generators have a manual start capability as a backup for the batter starting capablity, and in those cases, you should check both ways of starting your generator. 4. While running your generator each month, plug in a small appliance; a lamp or a portable drill or kitchen hand mixer, and run the appliance to make sure that the generator is producing electricity. 5. Remember that Portable Generators produce exhaust gasses when they operate, including carbon monoxide with is colorless and has no odor, and can be deadly. Always operate you portable generator outside of your home or business. And do not run a portable generator near an open window, because the carbon monoxide can blow into the home or business and endanger anyone inside. 6. Protect your Generator. When you operate your Portable Generator, shelter it from wet or damp conditions, to prevent shock hazards from the electricity being produced by the generator (and to keep your generator from shorting out, or from being damaged by corrosion). Then store your generator in a safe, dry place, to keep it ready for use during an emergency. 7. Generator fuel is flammable. Store fuel (usually gasoline) in a safe container, and in a safe, cool and well ventilated place that is not in the same space as where you operate the Portable Generator. Never add fuel to a generator until the generator cools down. Better to use flashlights for a while than take a chance on a fire or explosion! Black Creek Services, Inc. provides on-site repairs in Middleburg, Fleming Island, Green Cove Springs, Orange Park, and Jacksonville, Florida, as well as in our shop in Middleburg, Florida. We can also provide pickup and delivery of your portable generator. If your portable generator is hard to start, runs rough, or won’t start at all, before you start pricing a replacement, Call Black Creek Services, Inc. at 904.449.3986 or Contact Black Creek Services, Inc. for a free estimate. Often, with some minor repairs, we can have your portable generator running right and reliable again in no time. Do you have the right Generator? From heating and cooling to running the refrigerator, the microwave, the TV and even re-charging our cell phones, electrical power is something most people don’t want to be without very long. 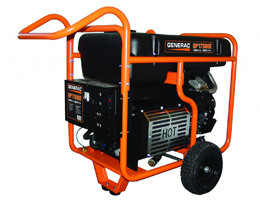 To provide temporary electrical power during a power outage, such as during a storm, or worse, in the event of hurricane damage, many people have purchased portable generators. Most people have heard that portable generators cannot be run inside their home (or even in their garage) because the exhaust of the small engine that runs the generator can produce hazardous levels of deadly carbon monoxide in closed spaces. But some portable generator owners don’t understand that portable generators are only supposed to be used to power several appliances in their home or office, via heavy duty extension cords plugged into the generators electrical outlets. Actually, before buying a portable generator, the first step is supposed to be deciding what your temporary power needs are, and then buying the generator that will provide sufficient electrical power to run the appliances you pick. Read more about determining the size portable generator that you need in our Black Creek Services article – What Size Portable Generator Do You Need? Some people have tried connecting their portable generators directly to their home or business breaker panel/electrical distribution panel. This is dangerous, because it creates an electrical hazard not only for the people using their portable generator this way, but also can backfeed electrical power into the local electrical grid, endangering others in the family, neighbors, and electrical service personnel when they start to restore normal electrical power to the area. 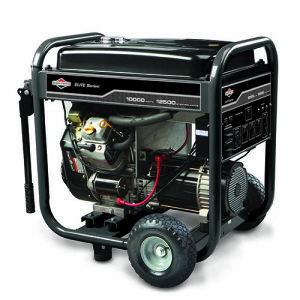 Portable Generators are for temporarily powering several appliances for a home or office. Permanent stand-by generators are larger units that can be installed in homes or offices and wired into breaker panels/distribution panels to provide backup power when there is a power outage. If you want to provide power to more than just a few appliances during a power outage, we recommend you look into a stand-by generator. In Clay County, Florida, a good resource for more information is our Clay County Florida Electrical Cooperative. Most people find portable generators an affordable option. Is your portable generator ready to provide you electrical power during a power outage? When is the last time you started it up and ran it for 5 to 10 minutes? If you can’t get your portable generator to start, or if you’d like to make sure your portable generator is ready for the next Hurricane, Call Black Creek Services 904.449.3986 for our Hurricane Season Generator Service, or Contact Black Creek Services! You can’t beat our in-shop price, and we can also provide mobile or pickup and delivery service. Small Engine maintenance and repair in the Jacksonville Florida area. Call 904.449.3986.